This post is intended for MySQL DBAs or Sysadmins who need to start using Apache Hadoop and want to integrate those 2 solutions. In this post I will cover some basic information about the Hadoop, focusing on Hive as well as MySQL and Hadoop/Hive integration. First of all, if you were dealing with MySQL or any other relational database most of your professional life (like I was), Hadoop may look different. Very different. Apparently, Hadoop is the opposite to any relational database. Unlike the database where we have a set of tables and indexes, Hadoop works with a set of text files. And… there are no indexes at all. And yes, this may be shocking, but all scans are sequential (full “table” scans in MySQL terms). So, when does Hadoop makes sense? First, Hadoop is great if you need to store huge amounts of data (we are talking about Petabytes now) and those data does not require real-time (milliseconds) response time. Hadoop works as a cluster of nodes (similar to MySQL Cluster) and all data are spread across the cluster (with redundancy), so it provides both high availability (if implemented correctly) and scalability. The data retrieval process (map/reduce) is a parallel process, so the more data nodes you will add to Hadoop the faster the process will be. Second, Hadoop may be very helpful if you need to store your historical data for a long period of time. For example: store the online orders for the last 3 years in MySQL and store all orders (including those mail and phone orders since 1986 in Hadoop for trend analysis and historical purposes). If you do not have a BLOBs or TEXTs in your table you can use “–direct” option which will probably be faster (it will use mysqldump). Another useful option is “–default-character-set”, for example for utf8 one can use “–default-character-set=utf8”. “–verify” option will help to check for data integrity. $ sqoop import --connect jdbc:mysql://mysql_host/db_name --table ORDERS --hive-import --where "order_date > '2013-07-01'"
Sqoop is great if you need to perform a “batch” import. For a realtime data integration, we can use MySQL Applier for Hadoop. 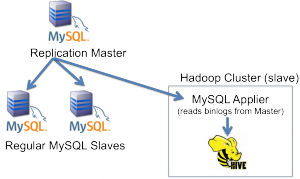 With the MySQL applier Hadoop / Hive will be integrated as if it is additional MySQL slave. MySQL Applier will read binlog events from the MySQL and “apply” those to our Hive table. In this post I have showed the ways to integrate MySQL and Hadoop (the big picture). 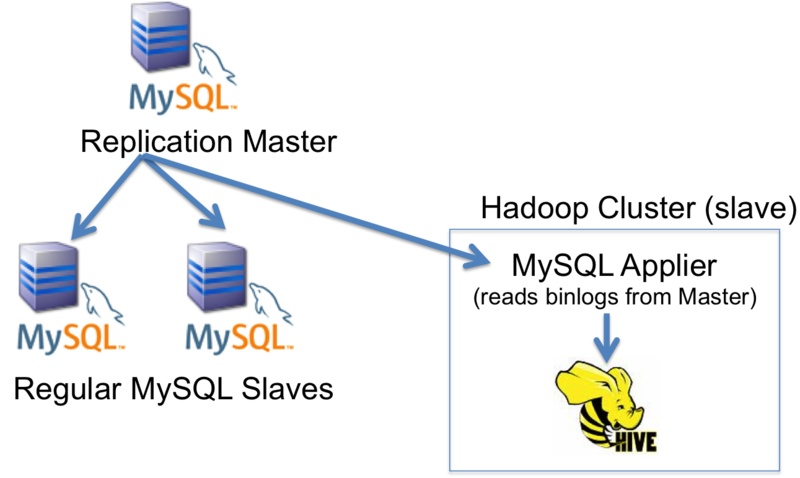 In the subsequent post I will show how to implement a data archiving with MySQL using Hadoop/Hive as a target. I am not sure if mysql-hadoop-applier is mature enough to recommend using it. While I am somewhat confident that it can handle INSERTs, I do not know how well it does on UPDATE/DELETEs. So it is dependant on how you use your database. I don’t think it does support deletes and updates. The point of hadoop is to throw everything in as an insert and work with the data later. It’s not there for consistency. True said Jonathan and Marc ! It is really good if it gets martured , and its quite interesting with the future of this project in terms of how it handles the updates as there is no update feature with underlying Hive/HDFS blocks ! If its really gets matured in terms of updates/deletes , it will removes many layers of critical workflows where sqoop involved !! is there a link for the followup post? Is there any other way to get answer like this? I tried with out success. Any way thanks for your help. I learned a lot from Besant Technologies in my college days. They are the Best Hadoop Training Institute in Chennai. I test MySQL Applier and Tungsten to do same tests.